Nicola Sturgeon has pledged to explore “all options” to help the 59 workers facing redundancy as a result of the closure of the Talk Talk call centre in Stornoway. At First Minister’s Questions yesterday, Ms Sturgeon said the “first priority” was to save jobs following the decision by one of the largest private sector employers on Lewis. The first minister was responding after the matter was raised by Western Isles MSP Alastair Allan. Mr Allan argued that the job losses would leave a “very big hole” in an island economy which was comparable to 1,800 redundancies in Glasgow. 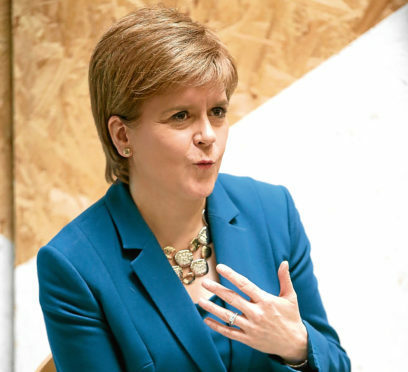 Ms Sturgeon responded that the Scottish Government’s redundancy initiative Partnership Action for Continuing Employment (PACE) would swing into action if required. She said: “I was very concerned to learn of the developments at Talk Talk in Stornoway yesterday and the impact this will have on the employees effected as was as on the local community and the point that Alastair Allan makes about scale here is very well made. “Our agency Highlands and Islands Enterprise has already in direct contact with Talk Talk both at local and national level. “We are committed to doing everything possible to address this situation urgently in the hope of obtaining a positive outcome. “Of course, in the unfortunate event of individuals facing redundancies, we stand ready to provide support through the PACE initiative.